A small step forward step in the prospect of long distance high-speed train services using the channel tunnel was taken this week, with Deutsche Bahn granted a ‘Certificate B’ to operate trains through the tunnel. This has been a long time coming – in 2010 DB was talking of running trains in time for the Olympics! However this week’s decision is only step towards eventual through services from London to destinations such as Amsterdam or Geneva. Here are a series of the other hurdles to overcome. The current Eurostar trains are 387m long, composed of a locomotive at each end, and 18 short carriages in between, and can be split in half if necessary. The idea is that in case of an accident or a fire in the tunnel, at least one door of the Eurostar trains would be close to an escape passage into the safety tunnel – and those escapes are at 250m intervals. DB proposes to run two 8-carriage ICEs coupled together through the tunnel, but passengers cannot pass between the two halves of coupled ICEs (see the coupling in a pic here). So would the ICEs get the safety permit to run? However at no time has a Eurostar ever been evacuated into the safety tunnel through one door. In short: not too complicated to solve. Current Eurostar trains have a locomotive at each end, and unpowered passenger carriages in between. Were a fire to break out in the traction or electrical components this would easily be isolated from passengers areas. 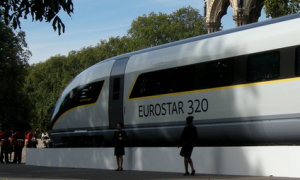 ICEs, and the new Eurostar e320 sets being procured, both use another system – distributed traction – where all traction and electrical components are under the floor below the carriages where the passengers sit. This could theoretically pose a greater fire risk, and the trains not be granted permission to operate in the tunnel. However Eurostar was itself ready to procure such trains, so must have been confident of approval. In short: not too complicated to solve. Both Eurostar’s new e320 trains, and the DB’s new Velaro D ICEs are essentially the same trains, just with Eurostar’s being a 16-carriage version, and DB’s an 8 carriage version. The problem is that procurement of these trains has been beset by delays – Eurostar now admits it will see its first trains only in 2015, rather than 2014 as hoped, while DB’s 16 new ICE were due to be running in 2011 but still are not approved fully, even in Germany. That’s before we come to the issue of approving them for at least Belgium and France, and possibly also Netherlands too. Approval of ICEs has been a nightmare before – current DB ICEs are only allowed to travel at 250km/h in Belgium due to concerns with flying ballast, and approval for the older ICEs on French high speed lines took 7 years to complete. Meanwhile signalling problems continue to beset the Belgium – Germany ICE connection. In short: a nightmare all round. Whatever the companies and manufacturers say, expect timetables to slip. Bags of all passenges boarding Eurostars in London, Lille, Brussels and Paris are scanned as passengers enter a secure terminal. This is why passengers are required to arrive 30 minutes ahead of departure. While one might quibble as to whether this security paranoia is necessary, it is nevertheless here to stay. The question then arises how DB, or Eurostar for its through services, could scan bags in different stations? While it might be possible to get a secure platform arranged in Frankfurt(Main) Hbf or Genève, I cannot see how this could easily be done in Köln Hbf, Rotterdam Centraal or Amsterdam Centraal. In short: could be complicated, and may necessitate services not stopping in some stations, or disembarkation (see below). The UK is not in Schengen, and this issue has already posed significant problems with the Lille Loophole. The basic idea with Eurostar is that passport controls should be conducted in Paris, Lille and Brussels (so-called juxtaposed controls) and not in London, because if an illegal immigrant gets to London (before a check there), then there is no obligation for Eurostar to transport them back to France or Belgium. The result of this is that for Eurostar’s through service from Aix-en-Provence to London, all passengers are required to disembark at Lille Europe for passport checks (and presumably a security control too), making the France-London journey take 55 minutes longer than the outward trip. DB has proposed that UK border checks be conducted on board the train, but I would imagine that Eurostar also proposed this for its Aix service and was refused. In short: this is the biggest headache, and could – on its own – kill the prospect of cross border through services. But a system of passport checks on arrival would require political will to deliver. So if you’re waiting for your ICE to Frankfurt(Main) or your Eurostar to Geneva, you might well be waiting a while. @Mike – I think the solution is going to have to be what Eurostar does with its Aix-en-Provence service: it obliges all passengers to get out in Lille for a passport check, making the journey to London 55 mins longer than the trip to London. See this. I don’t think passengers to Amsterdam are going to stand for that, and that’s why I ultimately fear we’re never going to see through services. I note that Eurostar have now announced e320 services to Brussels, Antwerp, Rotterdam and Amsterdam from December 2016. They’ve agreed this with NS, but I’ll be interested to see how they resolve the border control problem. Will this create another Lille Loophole, but this time with passengers travelling between the Netherlands and Belgium? I would not be a bit surprised if the UK Government insists on doing all border control and security checks via the existing facilities in Brussels. Siemens will still need to obtain interoperability authorisations to place the Velaro D & E320 into service in the tunnel. They have to be approved first though in France (also the UK highly unlikely to refuse authorisation if the French have approved). Siemens of course have the scars of previous battles with the French, getting the ICE 3MF approved for use on LGV Est. DB and Siemens intend to restart the approval process for the Velaro in Germany next month having made changes, being (very) optimistic they hope to get it into service in December. Things could move quickly if that was to happen, as a lot of testing has already taken place in France. fingers crossed! The Channel Tunnel IGC has actually already changed the rules on train length and distributed traction as part of its Unified Safety Rules review, in addition to a whole host of other rules. Trains are no longer required to be of a particular length or have power cars at either end. DB’s Part B certificate was in part an approval of evacuation plans from multiple unit trains. Charlie – thank you! I’d thought I’d read something along those lines, but couldn’t locate it. BUT does that mean ICE3s / 4Ds / Eurostar e320s are fine to operate? Or does every individual train type need an additional certificate still?